Teenage actions and decisions follow fiddle-footed cowboy Cole Slater and homebody Tina Sanchez into adulthood. Cole returns to Cowboy Creek in New Mexico, a place he’d run from. The back story of why he ran and why he was, as he put it, “such a jackass” in his teens certainly helps the reader see why Tina is skittish when it comes to trusting Cole. 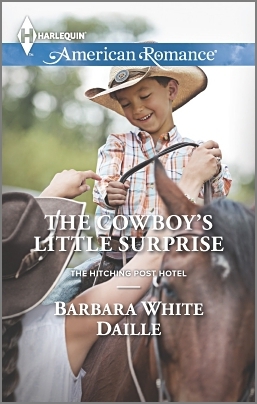 Tina’s back story that connects her with her Abuela and Jedediah Garland, the owner of the Hitching Post Hotel, reaches right into and squeezes the reader’s heart. Tina’s self-esteem is fragile and she guards it well. The very presence of Cole, the love of her life, tries her resolve to the limit. One of the best parts of the story is little Robbie and the way he sees the world. How he influences the actions of adults is delightful. The secondary characters like Tina’s cousins Andi and Jane; Cole’s sister Layne and her little son Scott add facets to the story that augment the concept of coping and overcoming heartbreaks. Also, Tina’s Abuela and Jedediah, even though getting on in years, still guard secrets well and manipulate with expert skill, yet with a love that is undeniable. The Cowboy’s Little Surprise entertains while it makes a strong statement about not letting the past control the future. Redemption and happiness can be realized. Barbara White Daille’s smooth writing style eases the reader away from the mundane, then into the lives of the characters and a quagmire of emotions.